Eva Phone is a part of Eva Communication Suite that addresses the Call & Contact management challenges. 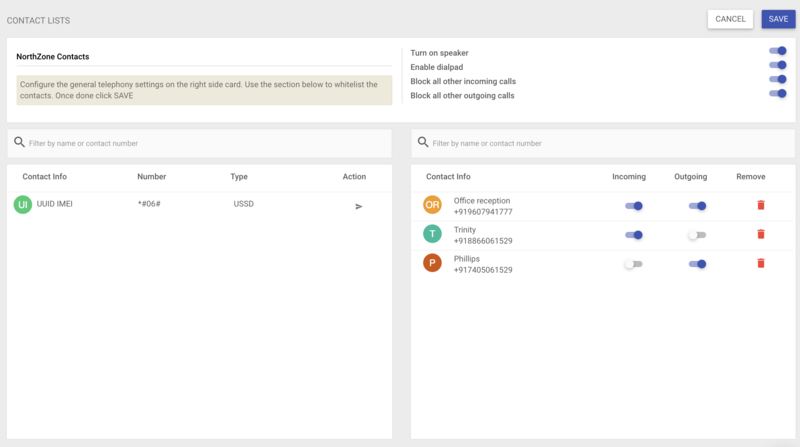 With Eva Phone, an organization can have unified contact lists across all MobiLock managed android devices, and control outgoing and incoming calls at a very granular level. Eva Phone helps reduce the overall cellular costs of a company by a great margin and streamlines your voice call traffic. 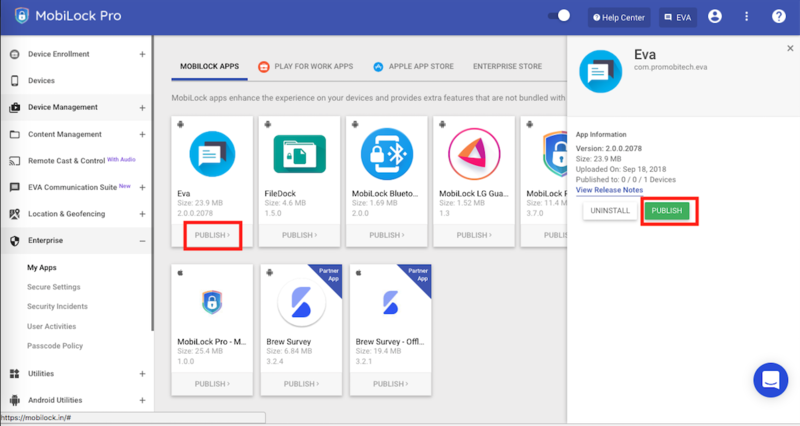 In this document we will see how to enable Eva Phone, setup the Eva client on MobiLock managed devices and create and publish contact list on MobiLock Dashboard. Navigate to Eva Communication Suite > Settings option. 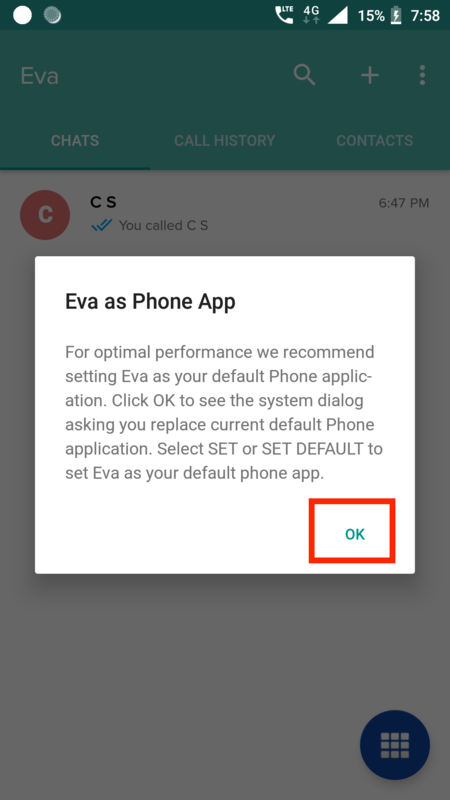 Enable the Eva Phone option and click SAVE SETTINGS. Navigate to Enterprise > My Apps > MOBILOCK APPS section. Once the application has been published, it will be downloaded on the devices. Click on the app-icon on MobiLock home screen and complete the installation. Once the installation is complete, launch Eva app. For first time user's, Eva app will silently sign-in to MobiLock service. Please follow the onscreen instructions to complete setup. CHATS: Displays all the active conversations that the user has. CALL HISTORY: Displays the last 100 outgoing or incoming calls. CONTACTS: Displays all the contacts that have been published from MobiLock Dashboard. For administrators who want to use Eva app on their Android phones, they can download the Eva app apk and install it on their personal devices. They need to login using their admin credentials. However the setup flow remains same. ADD CONTACT: Use this option to add one contact at a time. UPLOAD CSV: Use this option to upload multiple contacts at once. Contact Number: Select this option to add a complete contact number including country code. e.g. +11234567890; here ‘+1’ is a country code and ‘1234567890’ is a contact number. Starts With: Select this option when you want whitelist or blacklist a series of contact numbers in one go. e.g. +1123456; here any contact which is start with ‘+1123456’ is whitelisted or blacklisted. Once you have entered the number, click SAVE to add the number. Once the number has been added, it starts appearing in your Dashboard. The downloaded csv has 3 column headers, “name”, “contact number” and “ussd” with some sample values. Delete the sample values but DONOT delete the headers. You can use a text editor like TextEdit or notepad to edit the csv file. Start adding your contact information one by one. If the number being added is not a USSD then use false. Once done save the file. Once the file is uploaded successfully, the contacts will start appearing in your Dashboard. Navigate to Eva Communication Suites > Phone & click on CONTACT LISTS tab. Click on NEW CONTACT LIST button and then give a name for the contact list. Enter a name for your contact list in the dialog and click on SUBMIT. Existing Contacts: This panel on the left-hand side displays all the contacts that have been added to your Dashboard. You can use the arrow keys in this panel to move the contacts to the Contact Lists panel on the right side. Turn on speaker: This setting is used to automatically turn ON device speaker during incoming call or outgoing call. Enable Dialpad: If enabled, the end user will able to see dial pad option. Using this option, user's can open Eva dial pad and can dial any number or search for contacts. Only the numbers that are whitelisted are allowed though. Block all other Incoming calls: If enabled, Eva app will block all incoming calls except for the whitelisted numbers. 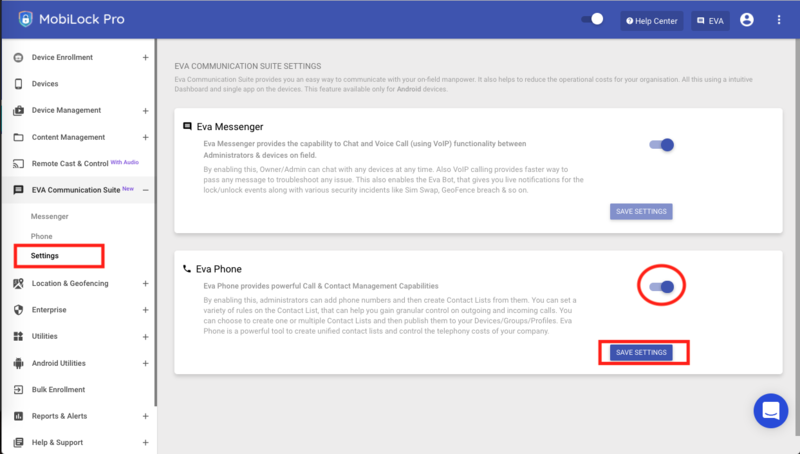 Block all other Outgoing calls: If enabled, Eva app will block all outgoing calls except for the whitelisted numbers. Contact Lists Panel: This panel on the right side is the list of contacts that are a part of this list. This section will show the contacts that you have moved from the Existing Contacts panel. Once a contact has been added to this panel you can choose to allow or block Incoming and Outgoing calls. Once you have created the Contact List, click SAVE. All your contact lists will appear under the CONTACT LISTS tab. Navigate to Eva Communication Suites > Phone & click on CONTACT LISTS tab. This screen will display all your contact lists. Publish: Use this option to publish the contact list to your devices, groups or profiles. Edit: Use this option to edit the contact list. Copy Contact List: Use this option to create a duplicate copy of this list. Unpublish: Use this option to un-publish the contact list and it's settings from all the devices that it is currently published to. Delete: Use this option to delete the contact list. Note that this will un-publish the contact lists from all the devices where it is published. To publish a contact list, click on 3 dots and select Publish. From the dialog select the Device Groups, Device Profiles or Devices. and click PUBLISH. Question: Is it mandatory to make Eva app as the default Phone application on device? Answer: Yes. Starting Android 6.0 this is a mandatory step for MobiLock managed devices and helps Eva control the outgoing and incoming calls seamlessly. For administrators using Eva app on their personal devices this step can be skipped. Question: Can we setup Eva as Phone if we did not do it on first time setup or upgrade? Answer: Yes. Please click on the 3 dots menu in the Eva application and choose Set Eva as Phone option. Question: Why don't we see my usual Dial pad or Incoming call screen once Eva is installed? Answer: That is because once Eva is set as phone app, it replaces the default phone application and hence shows a custom view. Question: Does Eva support call conferencing and call recording? Answer: No. Currently these are unsupported. Question: How do we remove Eva as Phone app as we no longer wish to use Eva Phone? Answer: Yes, this can be done once you disable Eva Phone from MobiLock Dashboard. 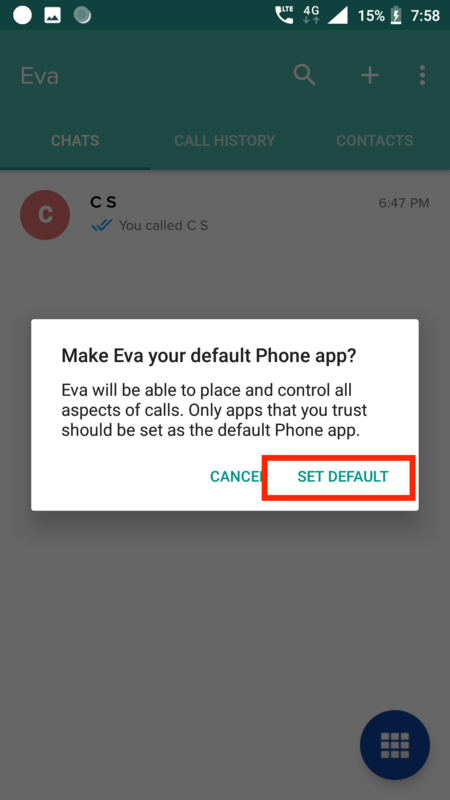 Once Eva Phone is disabled, launch Eva app on the managed device and click on the 3 dots menu in the Eva application and choose Remove Eva as Phone option. Question: Do we need a SIM card for Eva Phone features to work on device? Answer: Yes. Eva just replaces your default phone app so that it can give you better control on call & contact management. It uses the device SIM to place all the calls. Question: Can I publish multiple contact lists to the same Device Group, Profile or Devices? Answer: No. At any given point of time only one contact list can be published.